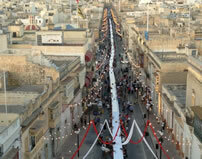 The Maltese are full of ideas: "The 'Dine Along the World's Longest Table' event, organized by the Żabbar local council, together with its Culture Action Team, was held on 27 July at Sanctuary Street in Zabbar, Malta; at 359 metres long, the dinning table used during the event beat the previous Guinness World Records' record of 302 metres and sets the new world record for the Longest dinning table, according to the World Record Academy: www.worldrecordacademy.com/. First, a substantial number of bricks were placed along the main road. These served as the base for the table, The Malta Independent reported. Then on next morning, planks of wood were placed, paving the way for the longest table in the world to take shape. At 359 metres long, it beat the ... read on."